The gorgeous Rubina was one of the ladies that answered my model call out for ladies with wedding dressed a couple months ago. But due to us both having busy schedules and vacations during the first weeks of July, we couldn’t fit in her session till the end of July. It sure was a long wait, I really wanted to see this dress she had tucked away in her crawl space. But it was so worth the wait. The dress is amazing! And so is Rubina. We had a great time pulling her dress out of the suitcase and getting her into the gorgeous and elaborate dress. Rubina even brought her tiara, and I dug out some lovely elbow length gloves to complete the outfit. I went with subtle and simple make up to keep the focus on Rubina’s gorgeous face and her beautiful wedding dress. I can not believe the dress has been in storage for years, it was in great shape. Rubina models a lot on Vancouver Island, and she nailed out poses like a pro! This meant we got to have a lot of fun being silly, and even had time to compare costume closets when we were done. If our taste in clothing is any indication, we were meant to be friends! I am looking forward to working with her again. 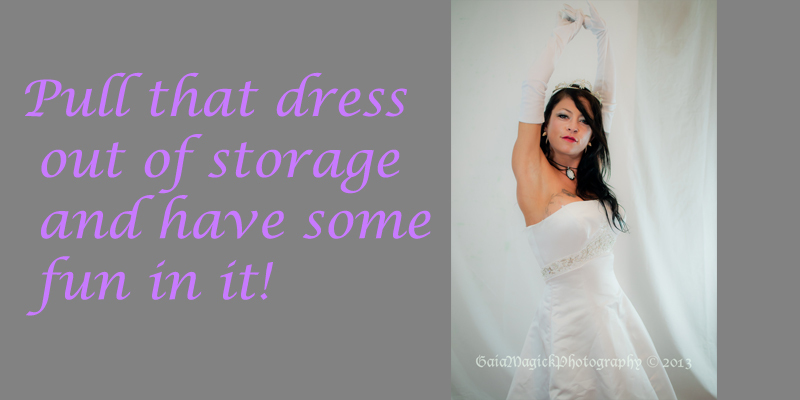 If you have a wedding dress, or even a grad dress, laying around in storage why not book yourself a Glam the Dress session and have some fun and make more great memories in that dress?! If you are worried you wont fit into the dress any more, no problems, I don’t shoot your back, so it doesn’t have to be a perfect fit-and I’ll sew you into the dress if nee be. Contact me to book your very own Glam the Dress session today, by phone 250-792-0868 or email gaiamagickphotography@hotmail.com. I promise you a stress free time, and lots more fun, in that dress!